AS Merko Ehitus has started the construction of the first stage of Tallinn-based Noblessner Home Port development project, which comprises Staapli 4 apartment building and the underground parking garage connecting the entire complex. By the end of 2017, there will be completed a 225-space underground garage and six-storey, 66-unit apartment building directly on the seashore with over 1,000 m² of commercial space at the ground floor. The Noblessner Home Port development project (http://noblessner.merko.ee/) encompasses four apartment buildings with 208 apartments and close to 3,700 m² of office and retail space. The second stage will consist of three apartment buildings at Staapli 3, 8 and 12. Noblessner Home Port is located just seven metres from the sea. The architecture was authored by an Estonian architectural design office Arhitektuuribüroo Pluss, the winner of an international invitational competition, which has put people´s living environment, logistics and activities in the focus. Cars will be parked on an underground level, ensuring space mainly for pedestrians and cyclists. Private and semi-private play and recreational areas will be created in the interior courtyards, and for pedestrian access, stairs will be established in the hillside on Kalaranna street facing the sea. The energy class B residential units are characterized by beautiful views, heat exchange forced air ventilation system and floor heating. The apartments have glass-enclosed balconies, and some apartments have a sauna and readiness for a fireplace. Homebuyers can choose from six interior finishing packages, developed in cooperation with interior architects Eeva Masso and Katrin Tammsaar. The price per square metre of the apartments ranges from 2,390–4,350 euros. The goal of the BLRT Group, which is developing the entire Noblessner port complex, is an integral and prestigious living, business and leisure time environment that puts a premium on the historical legacy and the picturesque seaside location. In the immediate vicinity is the Seaplane Harbour, Kalamaja Park and the European IT Agency headquarters to be completed by the end of 2017. By the completion of the first apartment building, the shipyard operations that historically were based here will be wound up. BLRT will demolish the production facility, build a promenade with a new plaza and renovate the yacht club and recondition the area around the Valukoda (foundry). 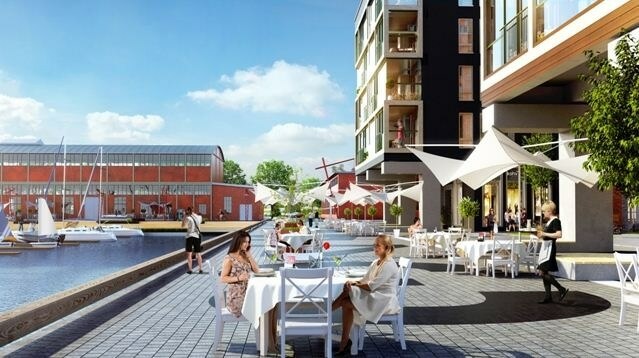 Today, access to the Noblessner quarter is via Tööstuse street, and an additional access route will be developed directly from Kalaranna street, including a pedestrian and cycle ramp that will be connected with the existing pedestrian and bike tunnel and sea promenade. Parking areas will be established, and later parking garages as well. The Noblessner Home Port project is being developed by Kodusadam OÜ, a joint venture, established in December 2014 by AS Merko Ehitus and BLRT Grupp AS, both owning 50% of the company. More information: Mr. Tiit Kuusik, Director of Residential Construction Division, AS Merko Ehitus Eesti, tel. +372 680 5105.